E.P.A. 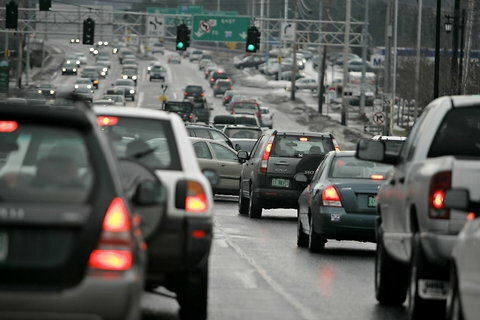 Soot Rules Expected This Week | "Global Possibilities"
Associated PressRush-hour traffic in Burlington, Vt. The federal Environmental Protection Agency plans to propose new air quality standards for soot by Thursday and issue final standards by Dec. 14 under a tentative agreement with 11 states that sued the agency earlier this year. The states, including New York and California, blame fine particulate matter from diesel trucks, buses, power plants and other sources for respiratory illnesses and other public health problems. After the E.P.A. postponed tightening soot standards last fall, deferring a periodic update mandated by the Clean Air Act, the states sued in February in United States District Court in Manhattan. Judge Robert L. Wilkins issued an order on June 2 giving the agency until June 7 to propose new rules but did not impose a deadline for finalizing the standards. The parties later agreed in principle to extend the deadline until Thursday and to have the agency issue final standards six months later, according to the office of Eric Schneiderman, the New York State attorney general. The E.P.A. had initially sought to delay the rule-making until next year. In court papers, officials cited “the abundance of new scientific evidence concerning the potential health and welfare effects of P.M. pollution” that they had to address as one reason for the delay. The Obama administration has also faced intense opposition to stricter air quality regulations from Congressional Republicans and industry critics who argue that tightening the rules would hurt economic growth. The E.P.A. last revised the standards in 2006.